Typically, oscilloscope users know what shape they should be seeing in their signal, but want to trigger on abnormalities in that shape. That's where these complex triggers are especially useful. 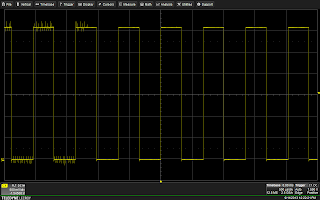 One tool that helps pin down issues is exclusion triggering based on characteristics such as signal timeout, glitch/pulse width, pattern width, or signal/pattern intervals. 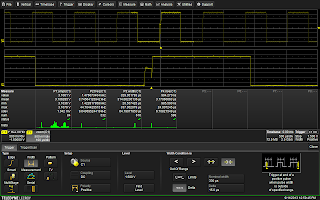 The exclusion trigger gives oscilloscope users the best likelihood of isolating rare events by keeping the triggering circuit active nearly 100% of the time. Let's take a look at an example of a signal with a runt pulse and a non-monotonic edge anomaly (Figure 1). Here, a simple positive-going edge trigger is in effect. Thus, the runt and non-monotonic edge are not obvious. The signal shown in Figure 1 is a 1.5-kHz square wave. One way to further characterize this signal would be to measure the width and rise time of the square wave, and then to use the oscilloscope's statistics and Histicons (histograms showing the distribution of measured values for each measurement parameter) features. Looking at the statistics on the width measurement for our square-wave example shows us that the mean pulse width value is 329 μs with a range of about 15 μs between the maximum and minimum values. 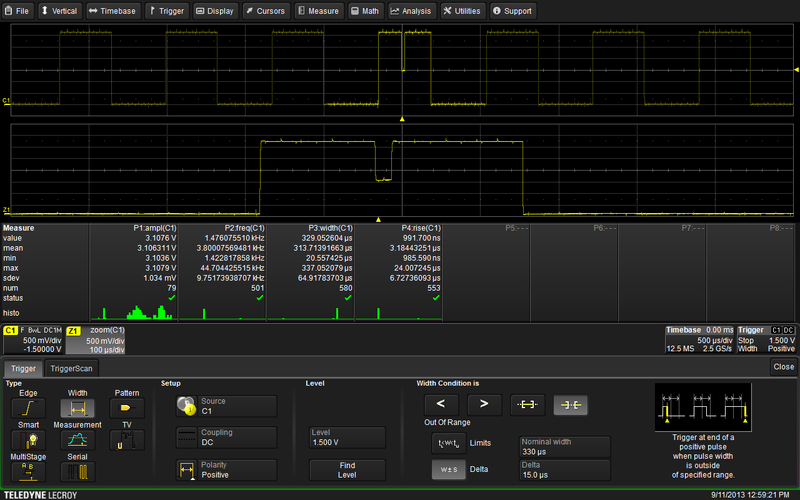 But if we let the oscilloscope pile up acquisitions on this signal for a few minutes, an outlier eventually appears with a width around 20 μs. Let's see how applying an exclusion trigger nails this little critter. What we'll do is set up a width trigger that excludes a small range of values around the nominal value. By doing so, we should get the oscilloscope to trigger on pulses that don't fit this "nominal" criteria. square-wave example: a non-monotonic edge. We already know that the nominal width of the square wave's pulses is around 329 μs and that there's something going on with a width of 20 μs. On the right side of the Trigger dialog box of Teledyne LeCroy's HDO oscilloscopes, one may set up width triggers with flexible conditions (Figure 2). In this case, we'll have the oscilloscope trigger when it acquires a positive pulse with a pulse width with a delta of more than 15 μs from the nominal value of 329 μs. If you'll recall, 15 μs was the variation in nominal pulse widths found until the 20-μs outlier showed up with repeated acquisitions. And... bingo! First, the instrument triggers on the runt pulse shown in Figure 2. For viewing convenience, the figure also shows a zoomed view of the glitch. Allowing the oscilloscope to continue triggering soon turns up a second problem, the fore-mentioned non-monotonic edge (Figure 3). Again, here are two glitches in our signal that would not be apparent with a simple edge trigger. 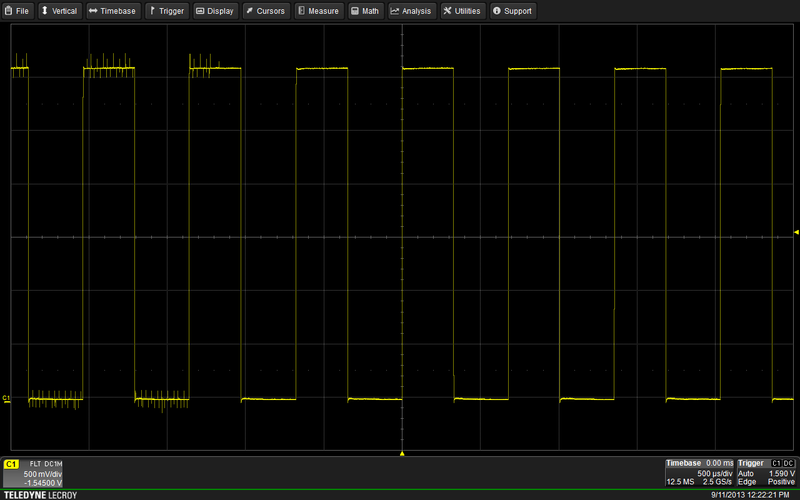 It took a bit more investigation using a more complex type of width trigger to turn up these two anomalies. This is only one example of how triggers can be tweaked beyond the simple category into much more powerful tools. Learning how to use them well goes a long way toward finding elusive problems in signals.